I live in a really old house. We’ve never actually done research to confirm the age of this house but we’re pretty sure it’s at least 150 years old. People back then didn’t have a lot of clothes and therefore they didn’t have need for many closets so you shouldn’t be shocked when I tell you that my entire 4 bedroom house has only 3 closets. Total. We’ve done our best over the years to find creative ways of storing our stuff but the one thing we had never dealt with successfully was our bedroom closet — until now. We bought one of those expandable closet organizer things at Lowe’s months ago and it has been sitting in the garage, mostly because I was dreading dealing with the closet. Dale is off this week for school vacation and he finally took the hint and started the closet project himself. I don’t have a “before” picture that shows how disastrous and messy our closet was so you’ll just have to imagine an overcrowded rack with a shelf above loaded down with bags and boxes. The floor was covered with shoes and discarded clothes and empty bags. It was a pit, I tell you. Just like “clean sweep” the first thing to do was empty everything out. I did get a picture of that. Like most home improvement projects, things had to look worse before they could look better. Then Dale swept and painted while I sorted through clothes and shoes and junk. He said the unit was pretty straight forward to install. It took longer than he thought it would but I think that’s true of most projects. While he worked on the installation I mostly sat around knitting. 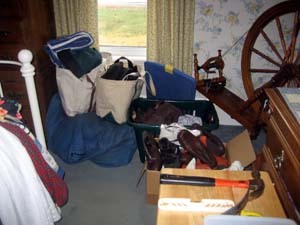 When things got close to being done, though, I sorted through shoes and clothes and stuff. I made some tough decisions, including getting rid of a sweater that I wore the weekend we went away to celebrate our engagement and the shoes I wore with my wedding gown, but when you have limited space you have to be brutal about how you allocate it. 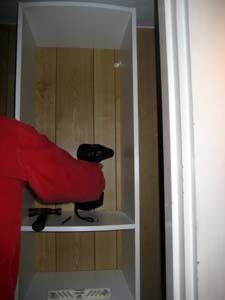 By the time Dale was finished installing the unit, I was ready to “move in” to our new closet. I was a little disappointed that the “full length” side of the unit is wider than I had hoped but it was important to get the shelves directly in front of the doorway and this was the sacrifice we had to make. Everything fit and the shelves are a wonderful addition to our space. The trick, of course, will be keeping it this neat. Wow. Seeing as how Dale is so good with closet organizers, and seeing as how he seems to have some time on his hands this week… um… can he come and do this to my closet?! Excellent job! It looks great. I am in the process of doing a reorganisation of my closet too. I am jealous you are done! well done team Carole! Nicely done! We just plain live in a small house, so I can always provide a before photo 😉 Your before sounds like my present. Now I just need your advice on how you get the husband to do the project in the first place! I should get something like that for our closets. We have very small closets and they are chock full. I did get rid of a bunch of stuff over vacation though and they do look slightly better. Very nice! We have a new(ish) house with lots of closet space, all of which is occupied in a quite messy way. I do not even want to tell you what occupies the guestroom closet. Well done! A perfect way to maximize limited space. That’s wonderful! Does he hire out?! My house is 120+ and don’t I know about the closets… And the ones you do have are a weird shape, I’m sure. I reconfigured our bedroom closet a couple of years ago, and added a shelf unit and that’s made such a difference! I’ve found I’m more apt to keep that neat than I am drawers — so stacks and piles it is! Ooh…this so appeals to the OCD part of my personality (because my closet is organized by type of garment, with subcategories for color and weight, dontcha know). I love those modular closet setups! My house is only 50 years old and we had 4 bedrooms and 4 closets when I moved in. Now we have 3 bedrooms and 5 closets. Can you guess what happened to that 4th bedroom? 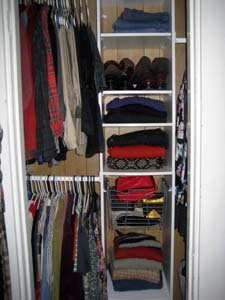 I am a huge fan of clean closets! We have a closet shortage in our house too. Oh but it looks Soooo much better. You will laugh at this – when D and I were looking at houses in RI to move there, we went to an open house for a very nice older home. As we are wandering around downstairs, we hear from upstairs (with that RI accent): Oh My God!!! There’s NO closets! I feel sure those people wound up with a newer house. Very, very nice. You know, if Dale ever starts itching to install more organizers, I could find some work for him …. What a marked improvement, I bet you’re just thrilled! Good job! Our house in NOLA was an 1823 creole cottage we restored and there were no closets. So even though we live in a house that has lots of closet space now, we have tons of chifferobes (sp?) and armoires…really good for holding all these books, yarn and fiber we’ve accumulated! Hmm, our house was built in the 1960’s and had zilch in the way of closets, too! When the last kid moved out, and we turned the fourth bedroom into a decent-sized bathroom, I got a closet out of the remodel and did exactly what you did, except that the bottom half of my center section is fitted with drawers. Oh, and we moved the full-length pole so that it goes from front to back, which gave me six more inches. 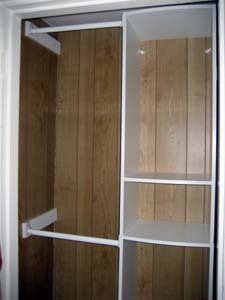 Oh, and we turned the original 5×8 “master bath” into a walk-in closet with more of those organizers. That’s all you have to do..move the kids out! Our house is mid-1960’s era but our closet situation is pretty sad too. We installed those closet systems in my girls rooms and it makes a big difference – when they actally choose to use the closet instead of dumping their stuff on the floor. I grew up in a house like that. My dad finally tore out the original closets when he remodeled and built larger ones. But your solution looks really good and a lot less drastic! The title of your post alone gave me shivers of fear. I have been slowly working on my closet. UGH! Nice. My house was built in 1865. 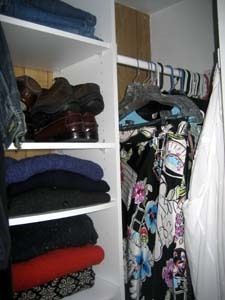 Three closets, two of which are under sloping roof. Could you guys come do my whole house, please? Thanks so much. Nice. I have tons of closets (1961), but I could still use an organizer in a few of them. My husband’s closet in particular needs a little closet elf to hang all his clothes up and put his shoes in their boxes and generally not just pile everything up on the floor. Container Store doesn’t sell closet elves. Yet. Looks great!! We have a big closet and I use most of the space. We are looking to buy a house soon, I’m hoping we get a closet the same size or bigger otherwise I’ll have to get rid of stuff, the horror! Thank you Carole! Me too;) good luck! Still, I kinda wish we had a master bath. You’re now making me extremely thankful that I have a large closet in my bedroom. Yours looks great and I’m sure you’re thrilled it’s finally installed. 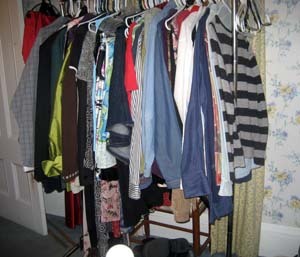 The “trick” to keeping the closet clean is to remember that every time you add a new item, an old item must leave. Wow that looks great!! Can you lend me Dale for some closet work over at my house???? Very nice closet makeover. Doesn’t it feel great to get rid of stuff that you just don’t need anymore? Our 125+ year old 3 1/2 br has only 2 closets upstairs. Some time ago the previous owners ‘took’ the closet from the adjacent bedroom, so we actually have a wall of closet space. Plenty! The other regular br has one of those long widthwise but shallow in depth closets. Regular hangers don’t work in there well. And the 1/2 br used to be a nursery that used to be accessed from the ‘big’ br, but that was all closed up. Big beds? Big bureaus? NOPE, none of it fits up the stairwell, nor would it fit in the rooms! The trick indeed…Right now it looks like an ad for Tupperware (you know, the kind that tempt you to buy all those egg/cheese/sausage roll keepers ‘cuz the cupboards in the brochure look so perfect). With only three closets, where do you keep your stash?! but of course it’seasier to keep neat when it starts out that way! yay for neat closets! Some towns, I have heard, taxed the owners of houses based on the number of rooms they had, and closets counted as such. Good luck keeping it tidy, but I bet you’ll be fine. They never do surprise visits to the Clean Sweep families six months after the show. I’d love to see that knock on the door. wonderful – looks like you made amazing progress to me! and I totally understand about the sentimental journey we can go on with our clothes…. so, inquiring minds want to know, did you secretly stash those wedding shoes under the bed? I think I would hvae! Clean sweep, spring cleaning, organization, it feels so good. I’m about to do some myself. I still have my wedding shoes. They fit three sizes ago. *sigh* I am weak. This old 4 bedroom house only has 3 closets, so I feel your pain! Great job Dale!! !